Spinach is one of the healthiest vegetables rich in vitamins & minerals. It also contains omega 3 fatty acids that is generally found in salmon, tuna, walnuts. Omega 3 fatty acids are one of the scarce nutrients in vegetarian diet. There is a debate to prove/unprove that vegetarian diet lacks in omega 3 acids. To know more about omega 3 fatty acids read here. 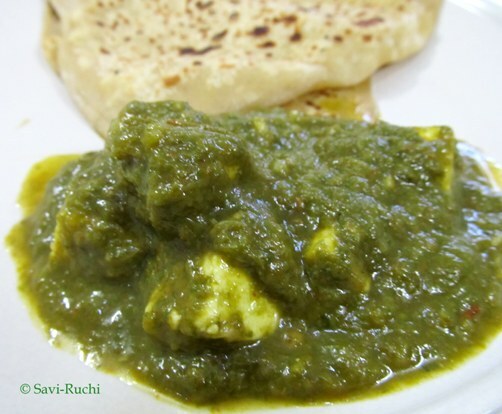 Coming to the palak paneer recipe, I have experimented a lot on this. I was somehow not able to get the taste that matches the restaurant style. Now after loads of trial & errors, I can say I make pretty decent palak paneer. Thanks to my friends who have provided numerous tips. 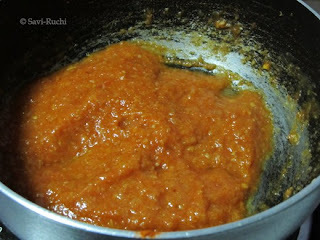 Tomato puree: 3/4 cup or 2 medium tomatoes deskinned & pureed. 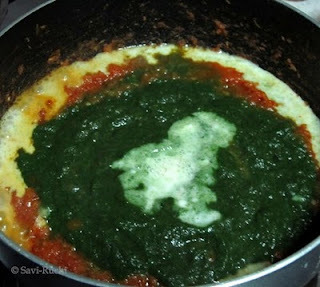 Blanch the spinach, puree the spinach & keep it aside. Heat butter/oil in a broad pan. 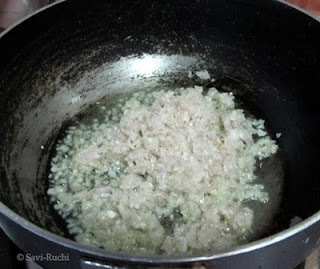 When butter is hot, add the paneer & saute them till slight brown on the edges. Drain the paneer on a tissue & soak the paneer in water for 5 mins. To the same pan, add finely minced onion & saute till the raw smell of the onions vanish. Add the ginger-garlic paste & saute again for another 2-3mins. Pour in the tomato puree, salt, red chilli powder, cumin seed powder & allow the puree to cook well on a medium heat for 8-10mins. The puree will thicken, leaves the edge of the pan & oozes out oil. 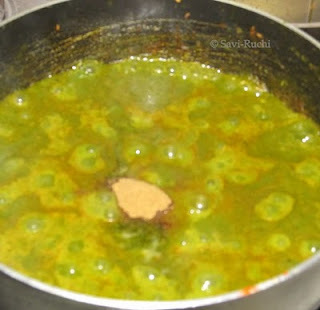 At this stage, add the pureed spinach, cream & mix well. Allow this gravy to cook for another 3-5mins. 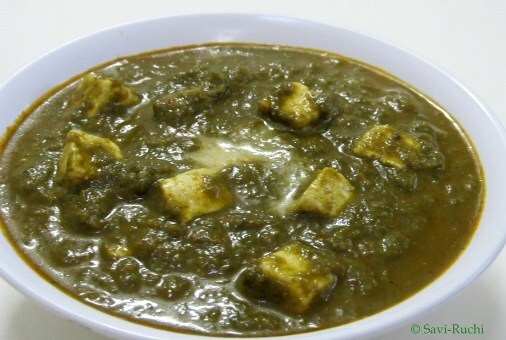 Add the garam masala, soaked paneer cubes & mix well. Cook on a medium heat for another 5 mins. Turn off the heat. 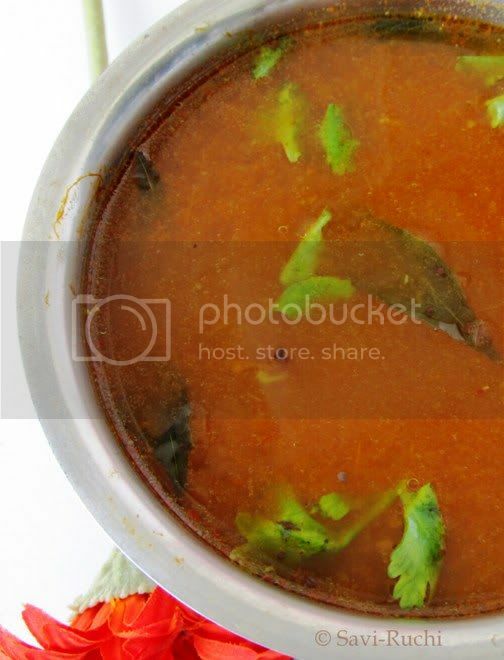 Serve it hot with plain parathas, chapathi or any Indian bread. If I find the paneer soft & good quality one, I do not fry them. I add them directly. It tastes good either ways. Baby spinach do not need blanching. Last note: My previous post is updated. Do check the post to know if you have identified it right! No clue this time. This is very simple, don't you think so? Update:Wow! !, all of you have guessed it right. It is indeed sapota/chiku tree. 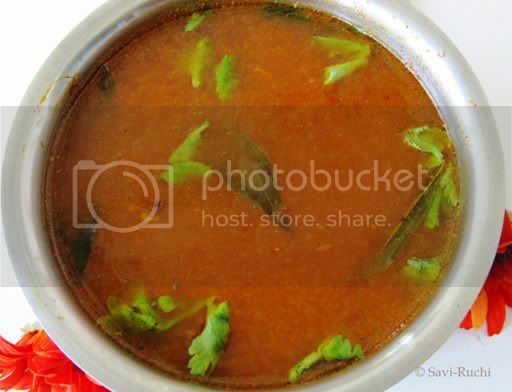 Alugadde palya tastes great as a side dish with any kinds of dosas(Indian crepes). 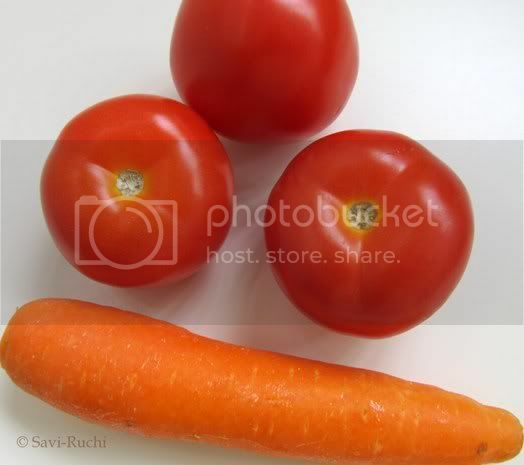 I normally add few vegetables to make it more healthier. Here is my version of the tasty alu sabzi. Boiled vegetables: 1 cup (I normally use frozen carrot, corn & green peas mixture). Boil the vegetables & allow them to cool (This step is not required for frozen vegetables). Meantime, heat a broad pan & add oil to it. When oil is hot, add mustard seeds, cumin seeds & urad dal. When mustard seeds splutter & dal turn golden brown, add curry leaves & green chilli paste. Saute for 30secs. To the tempering, add the onions & saute till onions become translucent. Add the ginger-garlic paste & saute for 2-3mins. Drain out the water completely from the boiled vegetables. Add the drained vegetables to the pan. Mash the potatoes gently & add the potatoes to the pan. Add salt, turmeric. Mix well. Cook it on a medium heat for a minute or two. Remove from heat. Add the lemon juice & garnish with coriander leaves. 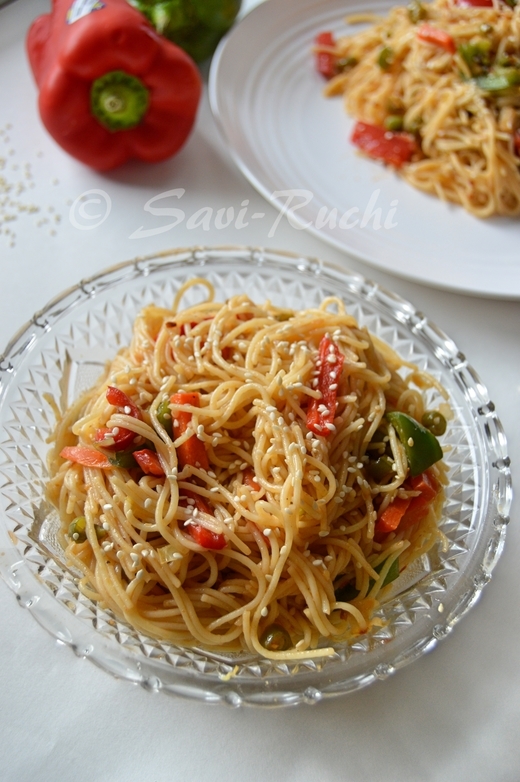 Chopped green chillies could be used instead of green chilli paste. 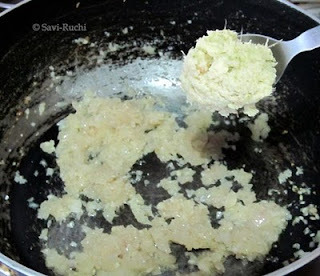 Ginger-garlic paste could be omitted(if you do not prefer it). 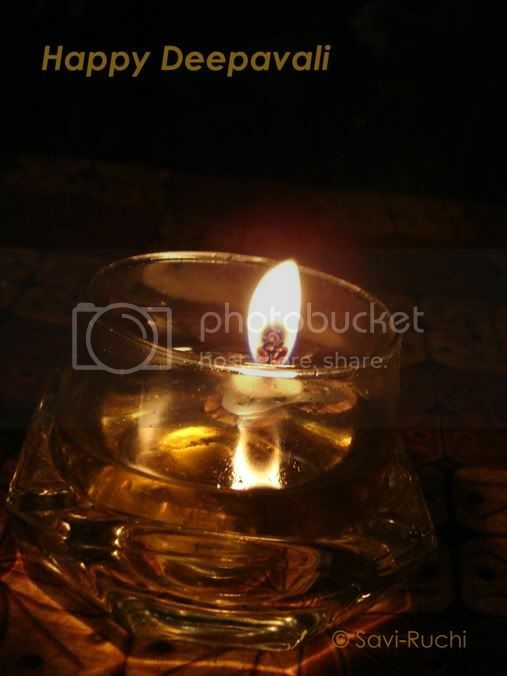 Wishing you & your family a very happy deepavali/diwali.